Posted on September 20, 2016 at 3:34 pm. 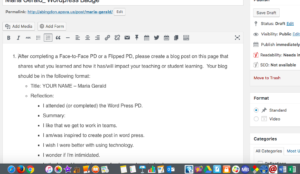 I attended (or completed) the Word Press PD. I like that we get to work in teams. I am/was inspired to create post in word press. I wish I were better with using technology. I wonder if I’m intimidated. In the future I hope to become fearless and use technology more. Please take a minute to read through this blog page to see what your colleagues are up to. Let’s learn from each other. Abingdon Selected as One of Four APS Schools Receiving Robotics Grants from Amazon and FIRST!